GO BIG REdesign and Pillow Tutorial - Jill Ruth & Co. 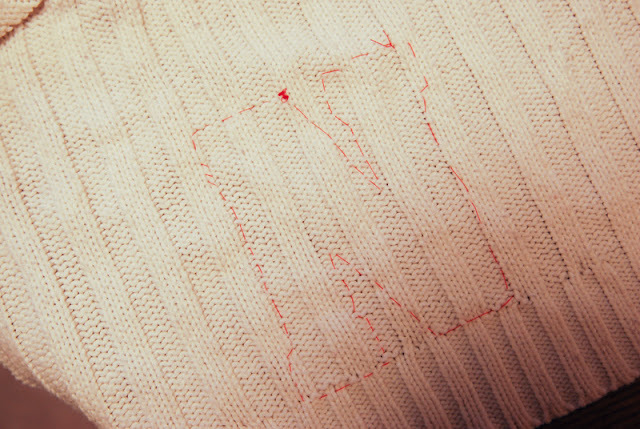 The other day, I pulled my one of my son's Husker T shirts out of the dryer and it's vintage-y look for some reason made we want to go stitch an "N" on an old sweater. I don't have a sweater to wear, but I have one to craft. I thought it would be warm and cozy and I have a daughter at the University of Nebraska so she might like this. Remember the Warm 'N Toasty Pumpkins? Well, this is what is left of one of the sweaters that I cut up. 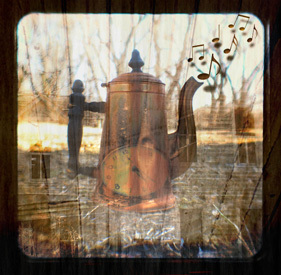 I used the back piece for this Go Big Red Project. 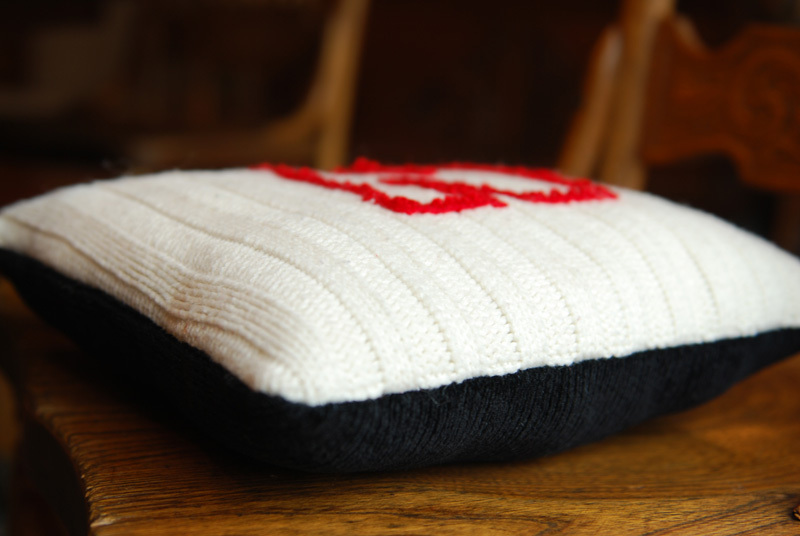 So here is how I made this pillow or as they say in the UK "cushion". love that. 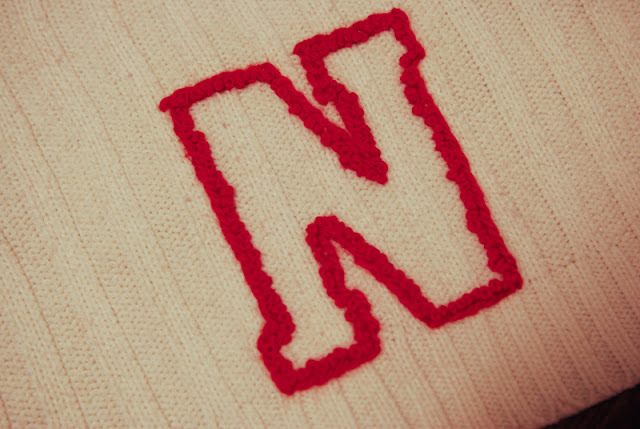 I printed out an "N" in a common font found on Husker wear and pinned it in place on my piece of sweater. Because of the sweater being off white, bumpy, and stretchy, I didn't think tracing around the letter with any kind of marker would be a good idea. I chose to baste around it instead with red thread while leaving the sweater piece on the table so as to not distort the sweater under my pattern. After removing my letter pattern, I have my "N" shape transferred on to my sweater piece. 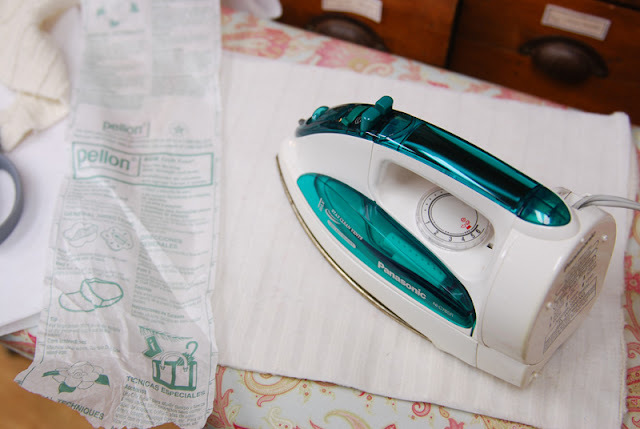 Next, I added a pellon iron-on interfacing cut to the same size to the back of the piece. 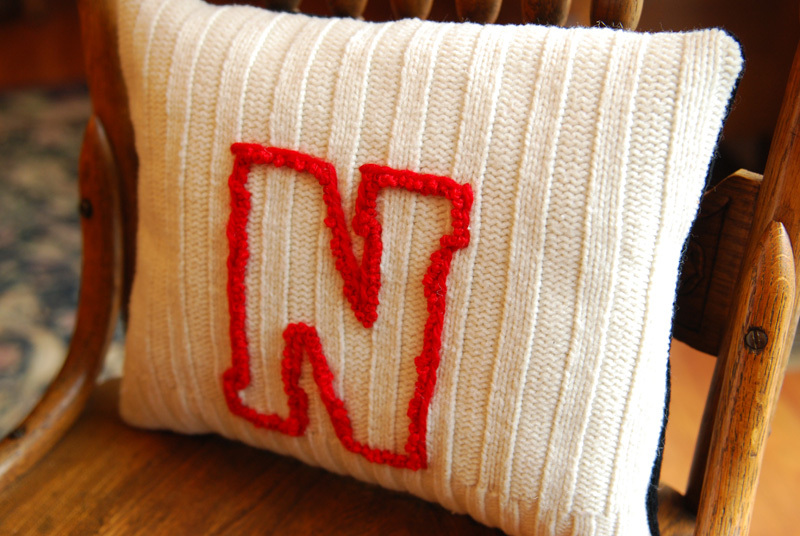 This gave the piece a lot of stability to begin stitching my "N" on to it. 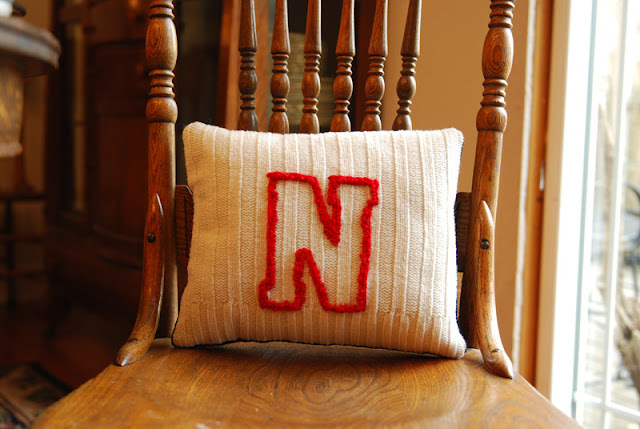 I took a chunky red yarn and large darning needle and did a simple outline stitch all around the "N". 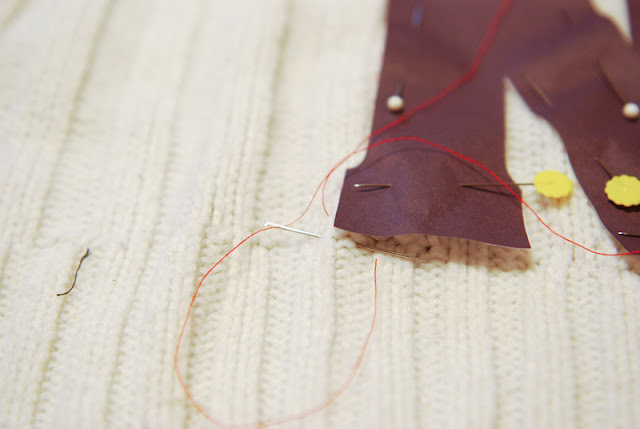 Here is a link to show you how to do an outline stitch. I used pretty long stitches because I was using bulky yarn on a bulky surface. I didn't go all the way through the interfacing on most of the stitches. I just slid the needle through the sweater. 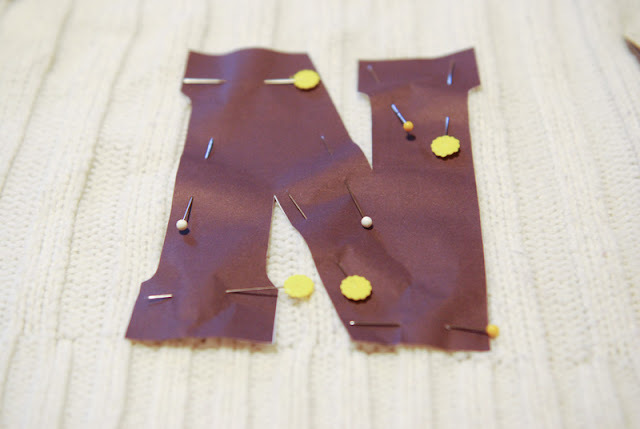 Next I made French Knots all along the inside of the outline of the "N" to give it a nubby texture and it aided in giving a bit of a vintage vibe to it. Link for a French Knot. I used a different yarn for the French Knots than for the outline. It was not quite as bulky and I thought a different yarn would enhance the textured feel. Then I really spiffed up the sweater with a clothes shaver to take off the little pilling that was there. Worked wonders. Both yarns are scraps that I have from garage sales/auctions so I'm afraid I can't tell you what they were. 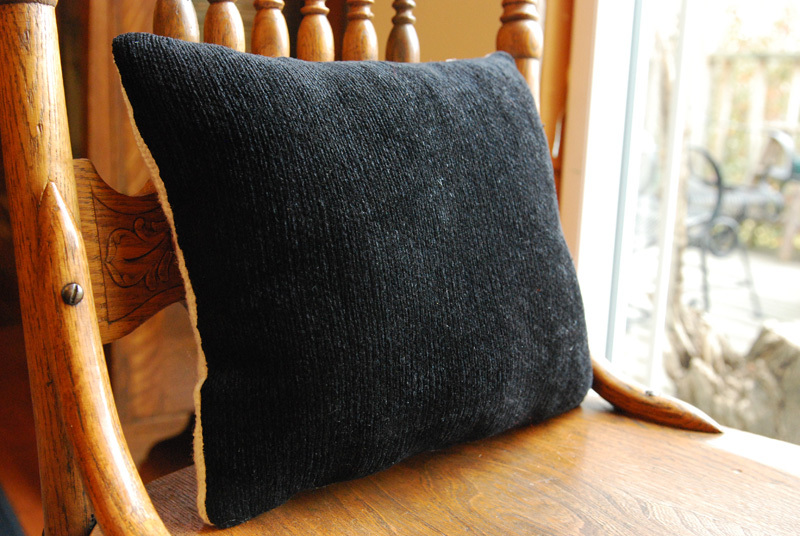 I used a piece of textured soft black fabric for the back. I just sewed right sides tother, turned, stuffed, and hand stitched the opening closed. For any of you old enough...does this make you think of pep club sweaters and black pants? 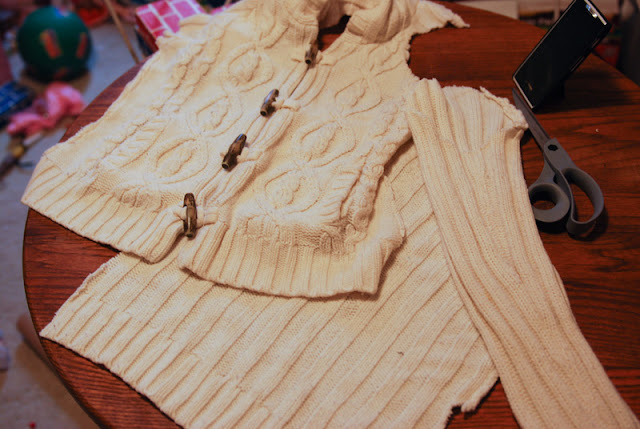 1. a stabilizer will really open up the possibilties of upcycling a sweater. 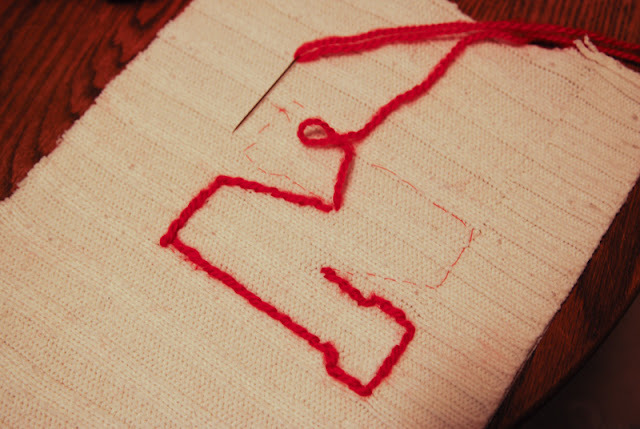 2. embroidery stitches can be used with yarn and not just embroidery floss. I think you'd need to stay with simple shapes in an embroidery project like this. Of course all letters and numbers would work, snowflakes, snowmen, houses...yes, I really like the idea of a house on a sweater pillow! By the way, my daughter received it in the mail yesterday and did like it! Love the look, so cozy. thanks for the tip about putting interfacing on the back to stablize the sweater - I'll be using that tip....and the pillow looks great!